Surely it wasn’t going to happen at THE PLAYERS Championship 2010, not with Clark at 5-under and trailing by seven through 36 holes. Then he went out and played his final 36 holes in 11 under with one bogey and won the purest test in golf against the deepest field on the PGA TOUR on a shrine to golf fans. How’s that for fate, Mr. Clark? Clark had piled up massive amounts of prize money without winning, making him sort of a trivia answer. But thanks to a perfect storm — third-round leader Lee Westwood shot a closing 74 and his closest pursuers, Robert Allenby and Lucas Glover had 70s — Clark put on a mid-round blitz of five birdies in six holes, shot 67, and claimed the $1.71 million prize. 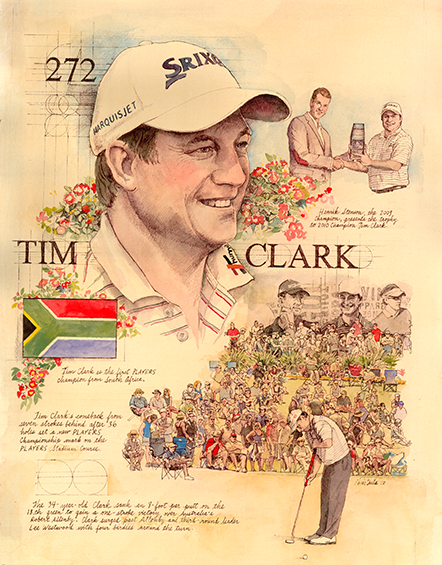 Finishing at 16-under 272, Clark beat Allenby by one and joined 2002 champion Craig Perks as the only players to make THE PLAYERS their first PGA TOUR win. It was the largest comeback from a 36-hole deficit by a winner and served to offer clear evidence that one never truly knows with this fickle game. “It’s been a long time,” said Clark.